The sauces are vegan friendly… Maybe not so much with the honey ones. Anyway, at this point I’m rambling. So to make a long story short, now I know how to make the wings and I’m going to show you how as well. This is going to be very different from my other post since I’m going to give you a basic recipe and instructions for the chicken and a few options for the sauce. Once the chicken has been made, any sauce will do as long as it is thick enough to coat the chicken. To get it to that point, simply dissolve cornstarch into it. Heat the oil in a pan on Medium or Medium High. Take the egg(s), mix in a bowl and set aside. Mix the flour and the seasoning together, either placing it in a plastic bag or in a separate bowl. If you dip each individual wing into the eggs and then the flour mix while it is in a bowl, the crust will look like the top picture. The second way to do this is the way my mother taught me how to flour chicken. With the flour mix in a plastic bag, dip the chicken in the eggs, drop them into the bag and shake until the meat is covered. This way leads to the chicken wings coming out much flakier like in the picture for the Kinda Korean BBQ. 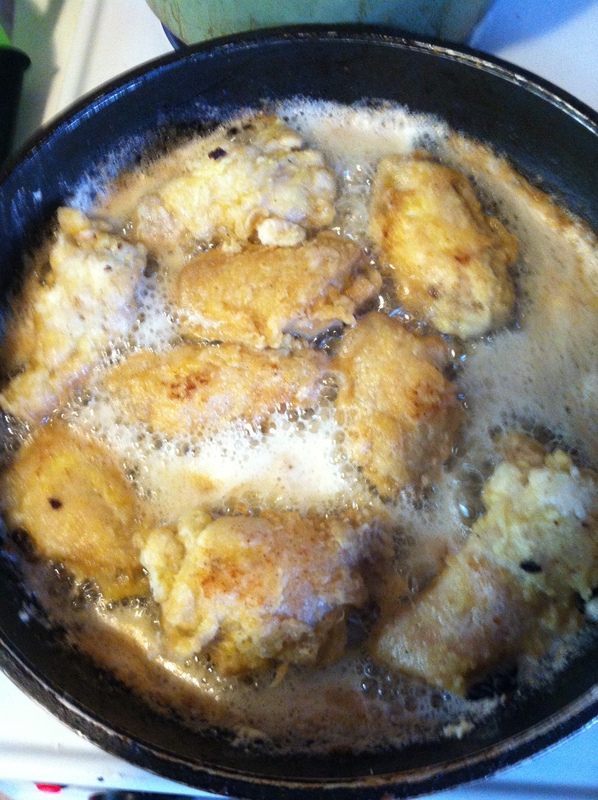 Once the chicken is coated in flour, pop them into the oil. Don’t worry so much about having leftover flour and egg mix because you’re better off having a little more than having less. After patting off as much excess water as possible, dip the chicken into the egg and then the flour. So right now, we are at a precipice of fate. 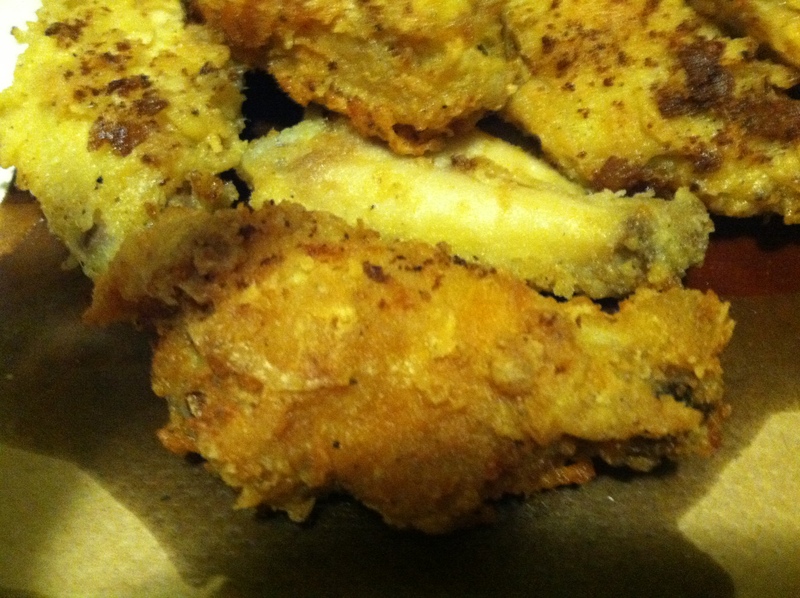 If you definitely want golden brown chicken, split the wings into three batches. Drop each individual chicken piece into the oil. Fry for 3 minutes for the cubes and 8-10 minutes for whole wings. Remove the chicken and allow it to cool while you fry the next batch. Make you sure you keep the batches separate while they are cooling. Once the all the batches have been fried, start refrying the chicken again starting with the first batch. 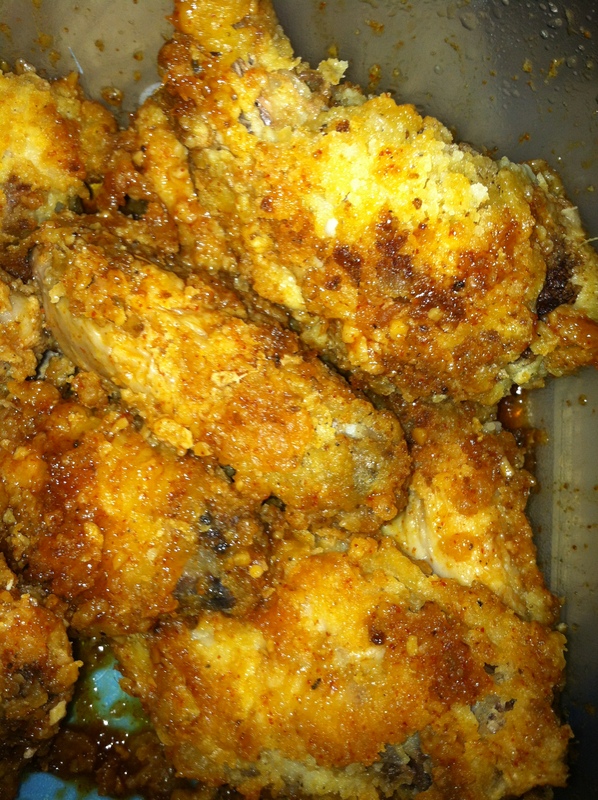 Cook for another 3 minutes for the cubes and 8-10 for the whole wings. Set aside on a paper towel to let the oil drain. If you just want the chicken cooked, just toss it into the oil. 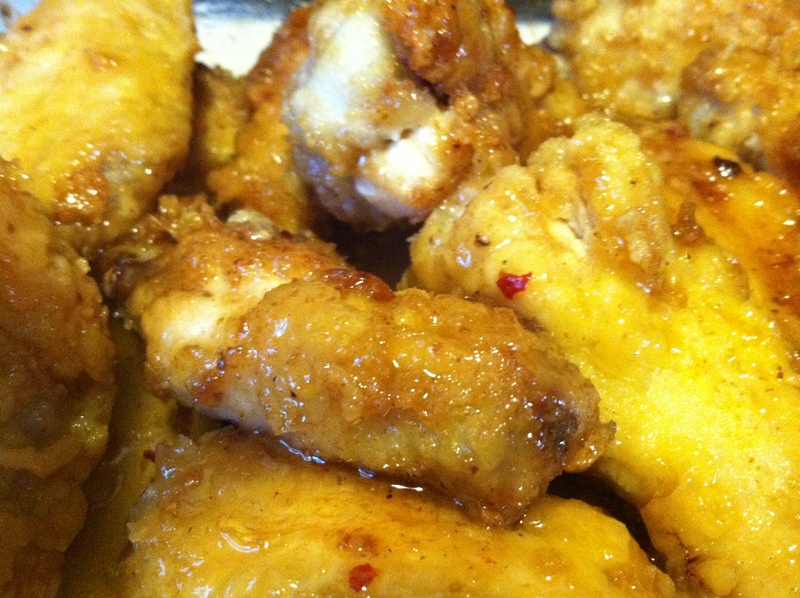 The wings will need to be cooked for a total of 25 minutes, so turn every ten minutes or so. The cubes are usually done in 10 minutes, so turn roughly every five minutes. Set aside on a paper town to let the oil drain. See, wasn’t that simple yet time consuming? Now that you have the chicken down, you can use any sauce you want to achieve the your desired results. I recommend Saveur or All Recipe as a recipe source. The following recipes are ones I’ve used and would happily force other people to consume. Funny story about this one! I was trying out a Korean BBQ sauce recipe when I realized that not only did I lack the gojujang paste that the recipe required, but also I didn’t feel like trying to find it. While scouring the Internet for a proper substitute, I figured I could use cayenne pepper instead. I ended up substituting the 3T of gojujang for 1T of cayenne pepper. This was both a good idea and a bad idea. 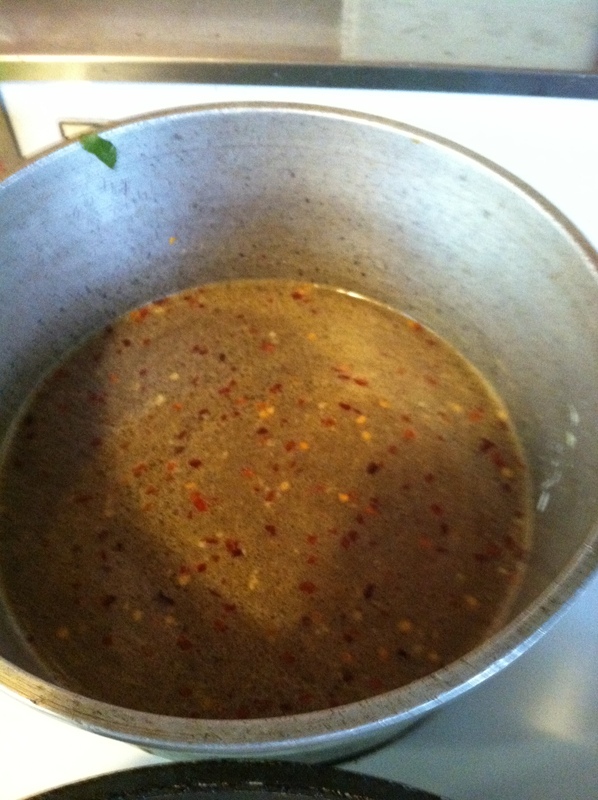 The sauce turned out delicious, but sauce is super spicy. After my sinuses cleared, I realized that it at the very least has flavor to it. This is good for about 1½lb of meat. Mix of the ingredients, except for the cornstarch, together in a pot over medium heat. Stir until well mixed. Sprinkle in the cornstarch slowly. You don’t want to just dump it in or else the cornstarch will clump up into useless lumps. This whole thing should only take a few minutes. Either use the sauce for dipping or coat the chicken in it. Because the base is hoisin sauce, the thickness is not an issue. Just combine every thing in a bowl and combine until everything is evened out. Either use the sauce for dipping or coat the chicken in it. This isn’t going to taste like the stuff you get at a restaurant because I’m not using the headache sauce (aka MSG). Cook the green onions, garlic, chilies or flakes, and the orange zest. Orange Zest is simply grated orange peel. Remember, the peel is what’s needed, not the white inner part. Cook this until the garlic is golden. Add the sugar, ginger, chicken broth, vinegar, soy sauce, sesame and peanut oil. Bring all of this to a boil. In the mean time, dissolve the cornstarch into the water. Add the cornstarch mixture to the sauce and stir until it fully thickens and is no longer clouded from the cornstarch. This makes enough sauce for 1½ – 2lbs of chicken. This title is a bit off, the sauce is neither spicy and can be used with things besides chicken. I personally thought it tasted a lot like the sauce I made for the Orange Ginger Salmon, but hey whatever. This is the chicken pictured at the very top. Gently boil everything but the cornstarch into a pot for about seven minutes. Stir on occasion to make sure everything is blended together. Slowly introduce the cornstarch into the mix until the sauce thickens and is no longer cloudy. Effectively speaking, it shouldn’t look like the picture to the left when you are done. This makes a large batch that can cover 4lbs of chicken. ← Something Needed to Be Done With the Beets!